The Kinderlach have returned with another high quality album that is by far their best yet. It is packed with fun and diverse songs and features a wide variety of other artists that take the album to another level. It’s geared towards a younger, most likely Israeli audience, but I’m not going to let that keep me from enjoying such an excellent collection of songs. If you liked the previous Kinderlach albums, you’ll enjoy this one too, and if you weren’t a big fan before it’s worth sampling Volume 3 because it’s a major step up. For the record, I did like the first two albums. The first track on the album is a medley, reminiscent of the “Pirchei Medley” on the first Kinderlach album. This one, though, features Ohad (throughout) who has a dynamic and powerful voice, and I think this version is much better. It’s a great song that you can listen to over and over since it is not repetitive at all. Ohad is a great choice for this song and to sing with Kinderlach is general. The music on this track is probably the most “traditional” of the album, which makes sense since it’s all Pirchei music. This song is a calm and pretty one that is largely words from Aishes Chayil in a unique melody. Unlike the first track, the featured artist comes in about 40% into the song. I have not heard much of Ben Snuf before, but he has a gorgeous voice. I love it at 3:13 when the Kinderlach sing behind Ben Snuf. This is a funky techno/rap song reminiscent of Just Do It on Volume 2. These songs seem to be big hits for Kinderlach but are not really my style (maybe geared more towards kids? not sure). The message is great– that we need to take care of ourselves and the Hebrew words “Im ein ani li mi li” are mixed in with English and modern Hebrew words of the same message. 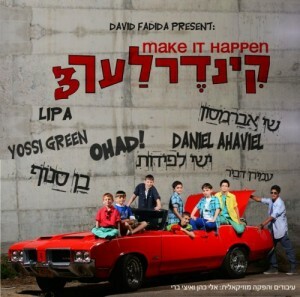 Lipa was a good choice here and its interesting to see him mixed in with the Hebrew rap of the Kinderlach, but it works! It’s a fun, positive song. This song feels almost like a faster lullaby, hence the lyrics. It’s “very Yossi Green” and his voice actually comes in before the Kinderlach (though as almost part of the music initially). This is a very sweet, upbeat song with a relaxed feel that will make you smile. The first song that doesn’t feature anyone but Kinderlach, this one is more suited for the Israeli audience. I’m going to be honest- with a few exceptions I have no idea what they are saying here. It’s a very fun enjoyable song featuring a Kinderlach rap and is has a modern pop/techno feel. We all have those songs that we can listen to over and over again, and for me Chemdat Lavavi is one of them. It’s hyptmotizing and get’s stuck in my head all day long, but not in an annoying way. I love the mix of Shay Abramson’s deep and powerful voice mixed with the sweet voices of the Kinderlach. It’s fast paced but laid back and manages to show off the kids’ voices very well, especially towards the end. Excellent excellent song. This song reminds me of Shir Hama’alos from Kinderlach 1. They both sound almost dream-like and are slow and beautiful tracks but have that modern techno featured just enough to make it Kinderlach but not too much to take away from the beauty of it. The last minute is especially gorgeous and the harmonies throughout are very impressive. For a usually fun singing group this song is particularly moving . Althoug the Kinderlach might be known for “Moshiach” and “Just Do It”, they are quite versatile and put out some amazing slow songs as well. Originally this was easily my favorite song on the album, but after multiple listens to the whole album it has some competition. It’s still amongst them. This is a extremely catchy pop/techno song that has an Israeli feel with familiar lyrics. I am surprised it didn’t come earlier in the album because it really is a standout track. You will be singing along the first listen! This is an updated Kinderlach version of the MBD hit. It’s much funkier while still retaining the quality– not an easy thing to do. It’s a pleasant medium tempo unique song. I love to see different artists’ spin on the same melody and words, and this is a great example of a time that both versions are successes. The boys might not like what I have to say about this song, but it’s all meant in a completely positive way! Despite the tough, cool, techno feel, the song is absolutely adorable (I think the poor English is endearing!). Its a high energy song that will wake you up. Of all the songs, I think this one may be the most repetitive, but it’s short so I have yet to find myself having that “Ok, end already!” feeling I get with some songs. Yishai Lapidot adds a twist and mixes the song up in a great way. This is an excellent song and it was hard for me not to list it in the favorites. I love the mix of Sephardi accents with Chasidish and even a little bit of Yiddish. The mix of modern music with traditional wedding lyrics is fun and it’s another one of those songs you can listen to over and over. Like Mode Ani it’s cute (sorry!) yet still high quality. Amiran Dvir is great, especially in the harmonies in the last minute. This is a very unique song. It’s an intense techno version of one of my favorite MBD songs. It’s a good driving or dancing around song and sounds almost like the song was recorded and then remixed with the amazing talents of Daniel Ahuviel on violin mixed in there. It’s also an interesting choice to end the album with, but it works. -The best decision on this album in my opinion was to feature so many other big names and talents. I love hearing kids and adults singing together, and they add a new flavor. -There’s a big mix of songs yet each song still sounds like a Kinderlach song. – Most techno songs cross the line into cheesy, but Kinderlach does a good job of avoiding this for the most part. Some songs are “cute” , but nothing to be done about that! Summary: The best Kinderlach album yet. The Kinderlach flavor was retained while stepping up a notch. If you strongly prefer traditional Jewish music, then you probably won’t be a big fan. Other than that, I think anyone would find a song on this album that they’ll love. Enjoy!